I’m choosing the “practical” option. I’ll quickly run through Love Story’s basics, then we can examine how the heck this thing ever made it to market. Love Story was developed by perfumer Anne Flipo. Its notes include neroli, orange blossom, stephanotis and cedar. In brief, it smells like orange blossom-scented laundry detergent. On first sniff, a hint of wet green, like a tight rose, permeates Love Story, but the fragrance quickly skips to sharp, detergent clean and stays in that groove, wafting with vigor. A hint of cedar sharpens the perfume further, until the whole thing dies about five hours later. I don’t smell any development or depth to speak of. At its best, Love Story is boring. At its worst, offensive. There are so many better orange blossom fragrances out there, even sharing shelf space with Love Story at the department store. For a restrained, elegant-yet-casual orange blossom, try Bottega Veneta Knot. For a lush, more oriental take on orange blossom, Elie Saab Le Parfum and Hermès 24, Faubourg await. Jo Malone Orange Blossom is pure and straightforward. Houbigant Oranger en Fleurs is a feminine, almost Victorian orange blossom. So, why did Chloé foist Love Story on us? Perfume can make a fashion brand good money. I understand why they keep the fragrance coming. But why this one? Why not something with character or, given its price tag, at least something that smells better than a guest soap floating in a chlorinated swimming pool? First, I think orange blossom has a reputation as a safe fragrance for Americans. We’re known for our love of “clean” smells, and orange blossom has scented our soap for decades. It’s an easy, low-risk fragrance to sell. Next, marketing sells, and maybe the company that owns Chloé figures that's good enough. Love Story claims to be inspired by the locks lovers fasten to Paris’s Pont des Arts. (This may not be such a dreamy story. The estimated 700,000+ locks caused one of the bridge’s parapets to collapse.) A glamorous French actress fronts the perfume. The bottle is cute. And many sales associates will tell the shopper that Love Story is “beautiful” as they hasten to the cash register.2 By buying Love Story, many people might feel they’re bringing home some of the aura of Chloé’s California-girl-in-a-French-boarding-school style. Which brings me to my final point: some people may not have the confidence in their own taste — or maybe the experience with fragrance — to reject Love Story. It’s easy to feel dumb about perfume when you're hearing romantic stories and mysterious terms like “headspace” and “neroli,” and when Chloé's chic stands behind it. It’s so easy to be convinced. And some shoppers want to be convinced. It's a high to buy an expensive, beautifully packaged unit of glamour like a bottle of perfume. I say, keep smelling, and keep making up your own mind about scent (and keep being willing to change it). Take samples home and get to know them. Spend your money on fragrances you're sure thrill you. This way we challenge mainstream perfume to up its game. 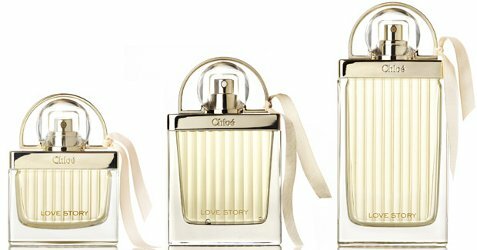 Chloé Love Story Eau de Parfum is $75 for 30 ml, $105 for 50 ml, and $130 for 75 ml. It’s available at many department stores and also comes in bath and body products. 1. Perhaps you adore Love Story. I’m glad, and I don’t judge you. Please comment and tell me I’m missing out! 2. The salesperson who gave me my sample did no such thing, I’m happy to report. I smelled this on a scent strip that fell out of the Ulta sale paper and was not impressed. Is this supposed to be a stand alone fragrance or just a flanker in time for Valentine’s Day? The Chloe aesthetic is a little too “Virgin Suicides” for my taste, but those bottles are gorgeous. Ha, Virgin Suicides. I do like the bottles too tho. Yes, the bottle is nice. I’d definitely try it, too! “Virgin Suicides” is a hilarious and scarily accurate way to describe Chloé’s style! I think this perfume is a standalone, but in a way they all feel like flankers. vintage chloé fashion wise was/is amazing especially the Lagerfeld for Chloé. Somewhat related to Chloé, I wonder what is holding off LVMH from releasing a Céline scent, even Marni has perfume so it’s odd to me why they haven’t tried to bottle the cool Phoebe Philo brought to the label and release a scent? While Philo was at chloé they didn’t release a scent, so maybe she the reason why they haven’t . Oh, now that’s a great question! I’m surprised Celine doesn’t have a perfume yet. On the other hand, I admire Celine, and I wince to think about how a thin, pandering perfume might wreck the “smartness” of their appeal. Then again, Marnie did a nice job with its scent. A guest soap floating in a chlorine pool- ouch! What a shame. I completely adore Love, Chloe so I’m a bit disappointed to hear that this new release is aggressively dull. My favorite is L’Eau de Chloé, and Love, Chloé is my next favorite. This one, not so much. It’s interesting, the question of the confidence to reject this style of perfume. I take it that, whether or not Love Story’s specifically a flanker, it’s a bit in the Woolite style of the contemporary Chloe EDP? My college-aged cousin recently decided she wanted to make that one her “signature”–I was careful not to rain on her parade, but I did take her to smell some more options, especially things in Chloe’s vein of a gentle accessible rose… But while she did like Diptyque Eau Rose, in the end she just liked the Chloe better, wore that sample more than the others. And I have to say, that seemed like an exertion of confidence, to decline the ones that, even if I was trying to tread lightly, she still surely knew I considered to be of higher quality! It’s true that taste does differ. As long as the decision is truly based on taste and not marketing. I have an anecdote which is a variant of yours. It’s summer here and I bought one tuberose stem (they are quite expensive) from a florist and put into a vase with some roses from our garden. My daughter sniffed the tuberose and declared that it ‘smells like perfume’. Ah yes, said I, that flower does appear in a lot of perfume, especially old fashioned perfume, so that’s probably what you are thinking of. Did she like it? No. Anyway, it seems from her remark that we perceive even the natural world through our experience of manufactured products. So true. It’s hard for me to appreciate lilacs as much anymore for just that reason! I think that’s a great point, C.H. Well, you do have a good point. As long as it’s a considered and conscious choice, then why not? If you want to smell like Love Story, go for it. But it should be a choice made with confidence. That is a damned shame, because Love Story is such a good name for a romantic scent (now that the movie of the same name has mostly faded from the public mind, being 45 years old). I would also like to mention, since you are talking about orange-blossom scents, L’Artisan Parfumeur Seville à l’Aube, which is by a huge margin the most beautiful orange-blossom I have ever smelled. Hey, Love means never having to say you’re sorry. . . for your perfume! It is a great name and actually got me interested because of the name. I agree–it’s a great name. One of my favorites for sure! I chose the orange flower fragrances I did because they were all on the shelf at Nordstrom, somewhere within spitting distance of Love Story. Yes! And the tiniest bit spoiled. Interesting. ‘Clean’ conjures up different scents depending where on the planet you were brought up. To me, orange blossom smells airy and happy, not ‘clean’ or ‘laundry detergent’. I’ve never associated ‘clean’ with anything else than screechy, cheap utilitarian soap which smells exactly like Chanel No. 5. Haven’t tried this one. Might give it a sniff, though. Do let me know what you think! And I like your associations with orange blossom much better. Well . . . the tester bottle was empty at my local perfume den. There must be a lot of laundry-smelling ladies out there! It’s clean and fresh now in your town! Why am I not surprised, that Chloe Love Story smells like detergent? Oh, right…. because almost all of the recent Chloe perfumes smell like detergent. Darn shame, as the Love Story bottle is adorable, yet still classy. While I detest laundry scents, I will still sniff this when I see it. Angela, which would you prefer to smell on someone…. Chloe (2008) or Love Story? No fair! This is like asking, Which would you prefer to eat: soap shavings or a bowl of synthetic flower blossoms? I don’t like orange blossom as a dominant note, mostly because I can’t dissociate it from “soap” scents, I expect. So, this one was not likely to win my vote in any case. But I am glad that even within the “practical” review, we still got a little Angela snark! It showed? Man. I need to work on that. I would (almost) buy this one unsniffed for the bottle alone, even though my try of BV Knot was not a success. I love that chant! I think I want to start saying it anyway, just to boggle people. Angela, I finished your new book last night, and it’s my favorite of the series. The Schiaparelli Tears dress was and inspired choice, and it’s great to see Joanna gaining confidence. Well done! I’m so glad you liked it! Thank you for telling me so. I think it’s my best one so far, too. It is a darling bottle. Fessing up that a guest soap floating in a chlorinated swimming pool holds some appeal to me, because I like soapy scents and am just about happiest when I’m swimming. Hey, then this might be perfect for you! Well, you’ll certainly find nothing skanky about Love Story. Thank God you said it, Angela. I thought it was just me. I can’t remember where I got my sample from,but all I can remember is that I didn’t like it. I do like the reformulated version of Chloe and of course the original. I have read magazines where they have people from different walks of life commenting on it. People have been giving it rave reviews. I thought there was something wrong with me. Glad to know I am not alone. I think none of us are alone when it comes to scent–there are so many different opinions out there that we’re sure to find company. As far as magazines go, I’m sure there are good fragrance reporters, but I can’t help but think that some of it is driven by advertising. The SA at my Nordstrom did not describe it as beautiful, but said approvingly that it was “very fresh and clean,” which made me shudder internally. I love the smell of orange blossom, and it doesn’t in itself turn perfumes soapy for me, but soap in a swimming pool is just about right. I didn’t like Knot either, but it is definitely a cut above this one. Orange blossom is so tricky! Sometimes it’s wonderful, and other times just not for me. Oh well, I guess perfume is hit and miss, anyway. I adore orange blossom, but I agree that this was slightly headache inducing. I have always loved Jo Malone’s Orange Blossom- it smells like sitting under a Tunisian bitter orange tree in bloom, drinking orange juice. But L’Artisan Parfumeur’s La Chasse Au Papillons is my very favourite orange blossom. Funny how it was created by the same perfumer as Love Story! There are some wonderful orange blossoms out there. I love how orange blossom can express itself in so many ways. But I guess I’d rather it not be through Love Story!